Automatic people detection from videos is an important task in many computer vision applications either for security and safety motivations or for business intelligence purposes. In order to achieve high person detection accuracy many authors propose the adoption of a depth sensor mounted in a top-view position in order to mitigate the effects of occlusions and illumination conditions on the performance. Unfortunately, most approaches presented so far in the scientific literature have been tested on very small datasets which do not account for the typical situations arising in real scenarios and consequently do not allow interested readers to figure out which method has to be used in the specific scenario at hand. 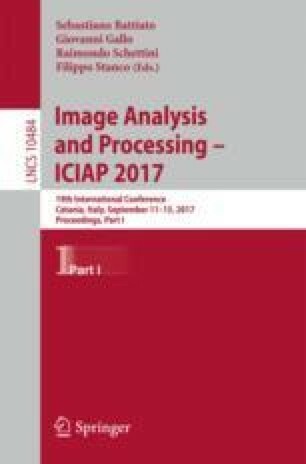 In this paper we benchmark two different approaches available in the literature for people detection from a zenithal mounted depth camera; the former is an unsupervised method aimed at finding the head of persons defined as the local minimum regions in the depth map, while the latter is based on the combination of the histograms of oriented gradient description and the support vector machine classifier. The benchmarking is performed on a public dataset of images captured in two different lighting conditions and with varying number of persons; this allows to assess the performance of the considered approaches under different real world scenarios. A detailed analysis of the two methods is reported in the experimental section of the paper allowing the reader to comprehend the pros and cons of each approach on the considered scenes.